A chilling novel by the Edgar Award-nominated author of Night Cruise. After the shattering murder/suicide of her children and husband, Kay Mandel seeks out abusive men and fatally poisons them. Soon she puts her past demons behind her and vows never to kill again. But someone has been watching Kay--and takes up where she left off. Great story. Complicated but not hard to follow. I love how Billie Sue delves into the psychosis of what makes Shadow a killer. Would have liked more back ground information about Son, but maybe that is another book in the making. Lots of in depth characters. The Kindle version has a few minor typos but not enough to really detract from the story. This was a great thriller. I would have liked to know a bit more about the aftermath of the ending, but then again a great writer always leaves you wanting more. Right? If you love crime thrillers you will really enjoy Widow. 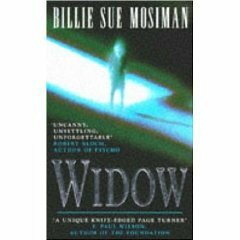 Have you read Widow? What are some of your favorite thrillers? Billie Sue is not very forthcoming with information about herself. In spite of having written numerous novels, I could find very little information and no press photo. She is a novelist, short story writer, columnist, writing instructor, editor. Her published novels are now available at Kindle.com, along with new short story anthologies and novellas. You can find out just a little bit more about her at her website. I have a few books by this author - she writes some interesting-sounding stuff, although I haven't had a chance to read any of them yet.